This video consists of fragments; notes from diaries and extracts from books. Thoughts about pregnancy and birth are intercut with statements and farewell letters from women who have committed suicide or participated in suicide attacks. The name is modified from a 19th-century medical term to describe the alleged arch shape a hysterical woman’s body makes. Two stories about life’s opposites: one dealing with birth, the other with loss. In spite of their contrast they have one important common denominator; both describe the mysterious fortune/misfortune of having to choose one’s own life. 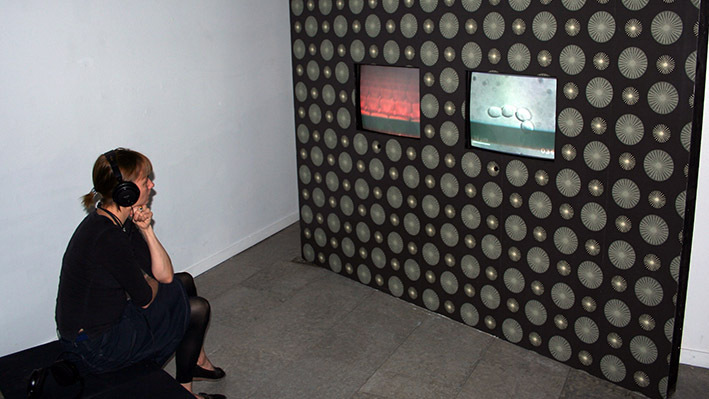 The work is presented a 2-channel installation with an interior wall and wallpaper, it is also available in Swedish.